Posted in: Meetings. Tagged: DPS 2016, Mars, Phobos. Borrowed from @GijsMulders — https://twitter.com/GijsMulders/status/789626580058251264. The last day of the meeting is always to hardest to write about because I’m usually so busy wrapping things up, I don’t have time to write (hence my writing this post from Boise on the Sunday AFTER the conference). In any case, lots of talks and goodbyes on the last day, but one talk that stands out for me came from Andrew Hesselbeck Hesselbrock, one of David Minton‘s grad students at Purdue’s EAPS. The talk tackled one of the longest-standing mysteries in solar system science: Why hasn’t Phobos crashed into Mars yet? Phobos (left) and Deimos (right). Mars has two tiny moons, Phobos and Deimos, which visibly resemble asteroids but are probably not for a long list of reasons. Phobos is close enough to Mars that Mars’ gravity is dragging the moon inward, similar to but in the opposite direction as the effect of the Earth’s gravity on the Moon. Phobos is so close, in fact, that astronomers expect it will spiral into Mars in just a few million years. Phobos and Deimos have probably been orbiting Mars for about the age of the solar system, 4.6 billion year. So if this orbital decay were the whole story, it would be mean we just caught Phobos right at the end of its life, about as likely as catching someone driving from Boise to New York City right as they pass through the Holland Tunnel*. Hesselbeck Hesselbrock suggested in this talk that we’re actually seeing a recurring phase in a much more dramatic story for Phobos. Instead of steadily spiraling in toward Mars for 4.6 billion years, Phobos (or at least a proto-Phobos) already spiraled in toward Mars before, millions of years ago. But when the satellite got close enough to Mars, Mars’ gravity ripped it apart and formed a disk of rubble around the planet. Soon after forming, this disk spread out, some moving toward Mars (and ultimately impacting the surface) and some moving away. Eventually, the bits that moved outward moved far enough away from Mars that they re-coalesced. In fact, Hesselbeck Hesselbrock speculated that Phobos has actually been reincarnated many times in this way, every time a little smaller than before, until we were left with the bitty moon we see today. As crazy as this hypothesis sounds, it could answer several puzzles of the Martian system, including accounting for cyclic sediment deposits on Mars’ surface — the deposits form every time Phobos falls aparts and bits rain down on Mars’ surface. Again, the annual DPS meeting astounds and amazes. Looking forward to Provo next year. The distance from Boise to New York City is about 2,475 miles, and the Holland Tunnel is about 9,000 feet long. Assuming a uniform driving speed, the probability of catching our driver in the tunnel is roughly equal to 9,000 feet/2,475 miles ~ 0.1%. The probability of catching Phobos during a 10 million year window over the age of the solar system is about 0.2%. Of course, you’re a little more likely to catch our driver in the Holland Tunnel, given NYC’s traffic. Posted in: Meetings. Tagged: atmospheric dynamics, celestial dynamics, Curiosity, DPS 2016, Mars. Fourth day of the DPS meeting, and I found myself sitting through some great plenary talks. 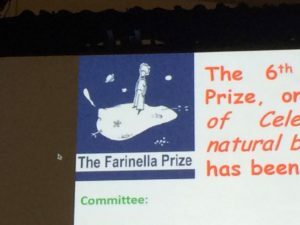 First up was Kleomenis Tsiganis‘s Farinella Prize lecture “Flavors of Chaos”, a rapid-fire tour of the intricate and complex web of gravitational interactions among planets and asteroids in our solar system. Tsiganis’s described how, using a combination of computational and pencil-and-paper techniques, we can pick at the threads in this cosmic network to tease out the early history and evolution of our solar system. For instance, the orbits of asteroids in the asteroid belt provide subtle clues that, billions of years ago, Jupiter moved inward almost to the orbit of Mars before backing out near to its current orbit, a celestial maneuver referred to as “The Grand Tack“. This presentation was followed by Leigh Fletcher‘s Urey Prize talk about the menagerie of seasonal changes we observe in the atmospheres for all the outer planets, from Jupiter to Neptune. The talk was full of beautiful images of the roiling and boiling of planetary atmospheres and concluded with Fletcher’s plea to send another mission to the Uranus or Neptune before he’s too old to participate (some plans from NASA have a mission launching to Uranus or Neptune sometime in the late 2020s/mid-2030s). Finally, we had a tag-team talk from Ashwin Vasaveda and Sanjeev Gupta about new results from Mars Curiosity rover. 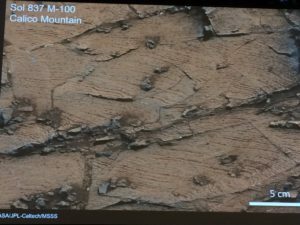 In addition to the stupefying images, the thing that impressed me most about the talk was just the level of detail to which we can infer the geological history of Gale Crater, where Curiosity landed. Gupta described how the tilt of beds of sedimentary rock could be used to infer the presence of a river delta spilling out into the crater, which suggests the existence of a long-lived (millions of years) lake in the crater, probably billions of years ago when Mars was warmer and wetter. Posted in: Meetings. Tagged: data science, DPS 2016, exoplanets, machine learning. Animation showing how a machine-learning algorithm decides where lies the boundary between two classes of objects. Third day of the DPS Meeting was full of fascinating talks about the orbital architectures of exoplanet systems. One that caught my attention was Dan Tamayo‘s talk on using machine-learning to classify the stability of a planetary system. As astronomers have discovered more potential planetary systems, it’s becoming more time-consuming to decide whether what we see are actually planets or some other thing that has fooled us into thinking they’re planets. When astronomers find what they think might be a planetary system, one of the first things they check is whether the putative planetary system is actually stable — that is, whether the gravitational tugs among the putative planets would cause the objects to crash into one another or be thrown out of the system. Since most of the planetary systems we find are probably billions of years, astronomers expect that real planetary systems are stable for billions of years, so if the system we’re looking out turns out to be unstable on short timescales (less than billions of years), we usually decide that it’s not really a planetary system (or that we mis-estimated the planetary parameters). Unfortunately, doing this check usually requires running big, complicated computer codes, called N-body simulations (“N” for the number of planets or bodies in the system) for hundreds or thousands of computer-hours. That can be a problem if you’ve got planetary candidates flooding in, as with the Kepler or upcoming TESS missions. So Tamayo created many, many synthetic planetary systems, some stable, some not, and had his machine-learning algorithm sort through them. According to Tamayo, his scheme was able to pick up on subtle features that helped distinguish stable systems from unstable ones with very high accuracy in a fraction of the time it would take to run an N-body simulation. I also attended an eye-opening talk from Patricia Knezek of NSF about unconscious biases and their effects in astronomy and planetary science. 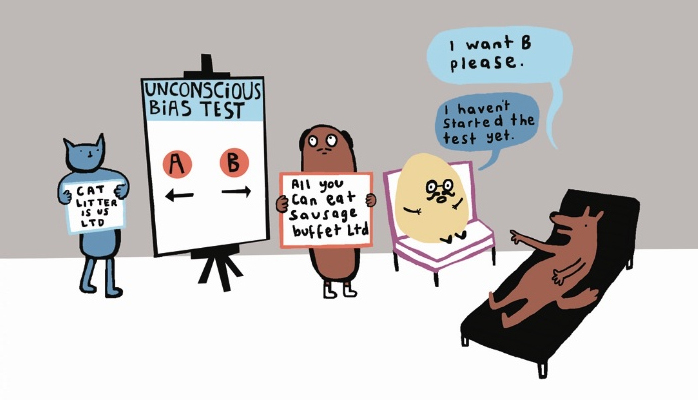 Knezek explained that several studies have shown how these biases cause everyone to draw unconscious conclusions about someone based on very cursory information, such as their first name, race, gender, etc. For instance, one study showed that the same application for a faculty position did much better if the applicant’s first name was “Brian” instead of “Karen”, even when women were evaluating the application. Fortunately, these same studies have shown several ways to mitigate the effects of these biases, and being aware of them is a big first step. Posted in: Meetings. Tagged: DPS 2016, exoplanets, hot jupiters, women in planetary science. 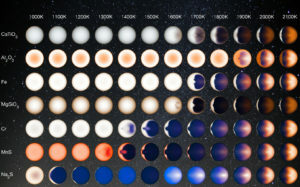 What hot Jupiters might look like for a range of atmospheric temperatures. From http://www.jpl.nasa.gov/spaceimages/details.php?id=PIA21074. Second day of DPS, and I enjoyed several fascinating sessions on exoplanet atmospheres. One of the most visually appealing talks was given by Vivian Parmentier, a planetary scientist at the Lunar and Planetary Lab. Parmentier talked about clouds in the atmospheres of hot Jupiters, gas giant planets similar in composition and structure to Jupiter but much closer to their host stars than Mercury is to our Sun. Because they’re so close to their stars, hot Jupiters are … well … very hot, with temperatures reaching thousands of degrees. These very high temperatures probably mean that the atmospheres contain clouds made of some exotic condensables, such as iron, cromium, or even ruby. In his talk, Parmentier explained that understanding what kinds of clouds might form in these atmospheres is important for interpreting the growing collection of spectra collected using the Hubble and Spitzer Space Telescopes. 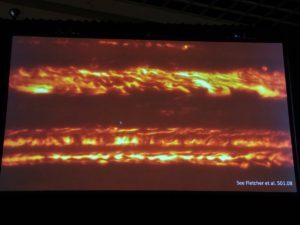 He also showed a beautiful photo album, realistically depicting the appearances of hot Jupiters for a range of atmospheric conditions. A detailed, if nuanced, story is emerging from these data, suggesting hot Jupiters have highly dynamic meteorology with chemically complex clouds. I attended the Women in Planetary Science Discussion Hour, at which we addressed several issues confronting the planetary science community when it comes to expanding diversity in the field. Several planetary scientists have conducted recent studies revealing the current state of the field (e.g., the fraction of women involved in space missions has not kept pace with the fraction of women in planetary science overall). These studies have also pointed out ways to expand our pool of talented scientists, including ways to improve faculty searches to make sure the people standing at the front of the classroom resemble more closely the people sitting behind the desks. The Women in Planetary Science blog gives a lot of relevant resources.